Powers/Abilities: Thor was a humanoid extraterrestrial, marginally taller than an average male human, and likely had traits and abilities matching his (?) own species. He captured live alien species using very elaborate plans. (Astonishing#36/4 (fb) - BTS) - Disguised as a prehistoric primitive and hidden near Beijing (Peking), Thor allowed himself to be frozen in ice and captured by humans. He was then transported to a museum in the USA to be studied. 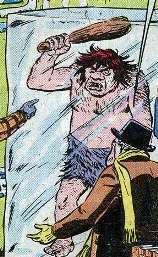 (Astonishing#36/4) - In winter-time, it was debated by museum staff whether or not the specimen should be defrosted, but its finder, Joe Bolton, insisted that the apparent prehistoric man be kept imprisoned in ice in case he was still alive and might go on a rampage. The specimen was then kept in cold storage. Not long after, a fire broke out in that section of the museum, defrosting the Peking Man, who then smashed his way outside using his club. The museum staff hunted for the escaped creature, ending up in the snow-covered park nearby. Thor, still disguised, then rushed after Bolton, chasing him across the park until Bolton fell into the icy lake. Thor and his crew later retrieved the body of Bolton, now encased in ice, and Thor then removed his disguise when he and his crew reached their home world of Jupiter. Thor was commended on finding such an excellent specimen of an Earth man, and they then questioned whether the man should be defrosted. Comments: Created by uncredited writer and Al Eadeh (pencils and inks). This story was reprinted in Chamber of Chills#10/3 (May, 1974), which is where the images are from. Thor (in disguise) is called the "Pithecanthrope Giant (Peking Man)" in the exhibit shown on the front cover of Chamber of Chills#10. Limited remains have been found of Peking Man (named after its location), which were first found in the 1920s, and is considered an example of Homo erectus from the Pleistocene Era. Joe Bolton was the discoverer of the would-be Peking Man. He refused to let the specimen be defrosted for fear that it could still be alive and rampage through the contemporary world. He was later captured by the extraterrestrial Thor and taken to Jupiter imprisoned and frozen in ice.